I love cooking for my boyfriend Andrew. Not only is he always appreciative and free with his praise, but he is also incredibly open-minded about trying new things. The other day I was reading a blog post about soup, and one of the commenters had written that she couldn't make the dish because her boyfriend "doesn't like soup." There are approximately one billion types of soup, how could one just write them all off? I could understand it if a person said that she didn't like a certain type of soup (such as cream of mushroom, which happens to be the worst thing ever), but making a unilateral decision about all soup- I just don't get it. This reminded me once again how thankful I am to have a life partner that shares my sense of adventure when it comes to food (and I guess he is alright in other ways, too). Open-mindedness aside, there are a few ingredients that Andrew just does not love. These include sun-dried tomatoes, olives, eggplant, and capers (especially capers); all things which I happen to love. Because I am a selfish individual I insist on using these ingredients time and time again. After I subjected him to a very Kelly-centric grilled eggplant and olive pizza (I loved the flavors, but thought that the eggplant was too greasy), I figured that it was probably time to do him a solid and make a pizza without any of his least favorite ingredients. So once again I turned to the much-maligned (though much loved by me) Rachael Ray for inspiration. I spotted this sausage and onion pizza in the September issue of Everyday with Rachael Ray and I thought that it would be perfect for, uh, Andrew. Um, yes, that's right, I was definitely not thinking about how much I love kielbasa and gruyere and caramelized onions. Ok, fine, I wanted it; but I was sure that Andrew would love it too, and I was not wrong. As soon as he tasted this pizza, with its awesome combination of sweet onions, salty turkey sausage, and rich and nutty gruyere, he said, "Now this is my kind of pizza." Ah, success. A delicious dinner, and I just bought myself a few eggplant and caper-including meals. Preheat oven, and a pizza stone, if available, to 500 degrees. In a large skillet, heat 1 tablespoon oil over medium heat. Add kielbasa and cook, stirring, until browned, about 5 minutes. Use a slotted spoon to transfer to a bowl and set aside. Add an additional tablespoon of oil to the skillet and raise heat to medium high. 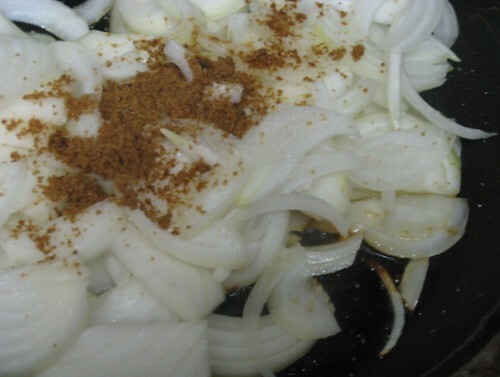 Add the onions, sugar, and a pinch of salt to the pan and cook, stirring frequently, until most of the liquid has evaporated and the onions are starting to brown, about 5 minutes. Lower heat to low and continue cooking until the onions are deeply golden, 10 to 15 minutes. Season with pepper and a pinch of dried thyme, if using. Roll and stretch dough into a 14" circle, and place on a sheet of parchment, sprinkled with cornmeal if desired, on a pizza peel or the bottom of a sheet pat. 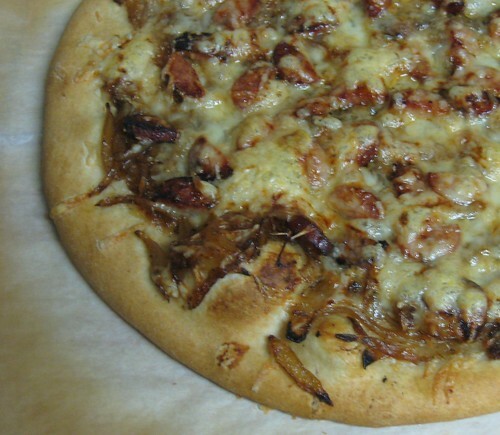 Spread caramelized onions over dough, then top with kielbasa, fresh thyme, and shredded gruyere. Slide pizza onto preheated stone and bake until the crust is golden brown, 15 to 20 minutes. If you do not have a pizza stone, press the dough into an 11" by 18" baking sheet and continue as directed. This is Smitten Kitchen's recipe, doubled, with some whole wheat flour swapped for the white. Head over to her site for more detailed instructions (and plan on staying there for a while, Deb's site is amazing). Stir together flour, salt, and yeast in a large bowl. Add water and olive oil and stir until the dough starts to come together. Dump the dough onto a lightly floured counter and knead for a minute or two until smooth. Form the dough into a ball and place in an oiled bowl, turning to coat. Cover with plastic wrap and let rise until doubled in bulk, 1 to 2 hours. Dump the dough onto a floured counter and gently press out the air. Form into a ball and let rest, under plastic, for 20 minutes before rolling.